Killer Instinct | Survey Says: The Return of the Textual Stream! Hello everyone. So I’ve seen many of you ask about what happened to the Textual Stream, and I was wondering the same thing. We got so absorbed into making the game and communicating directly to you all in the forums and Twitter, that these slipped by. Anyway, we won’t let that happen again – and the Community Survey seemed like a great place to start! This year’s survey received over 9,500 responses, triple that of Season 2. So in short, you all are awesome and Killer Instinct keeps getting bigger and bigger. Aside from the benefit of throwing you off the scent of Eyedol, we made this survey so that we could understand how you play, how to make the game better, and also make sure that we’re making the content that makes Killer Instinct better. Let’s start out with Difficulty. 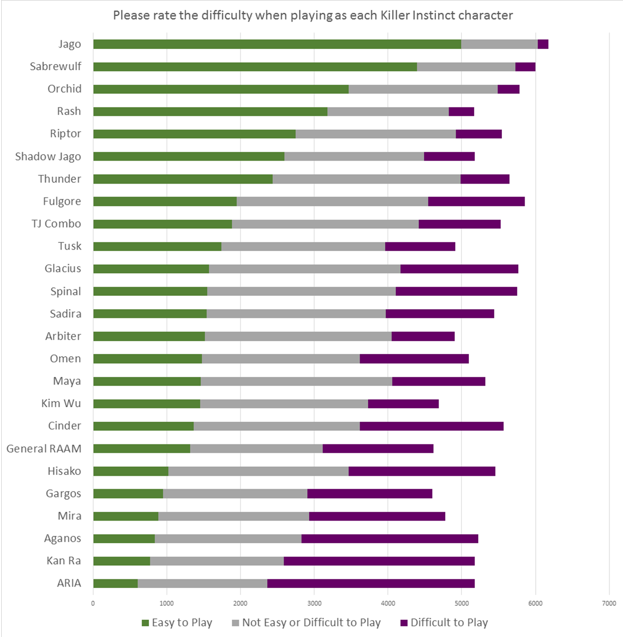 We asked you all how easy or difficult it was to use each character. It’s no surprise that you all are very familiar with Jago – he has an entire Dojo dedicated to him! Sabrewulf, Orchid and Rash rounded up the top four. Two of our most trickiest characters, ARIA, and the oft-discussed Kan-Ra have proven to be the most challenging characters to master. 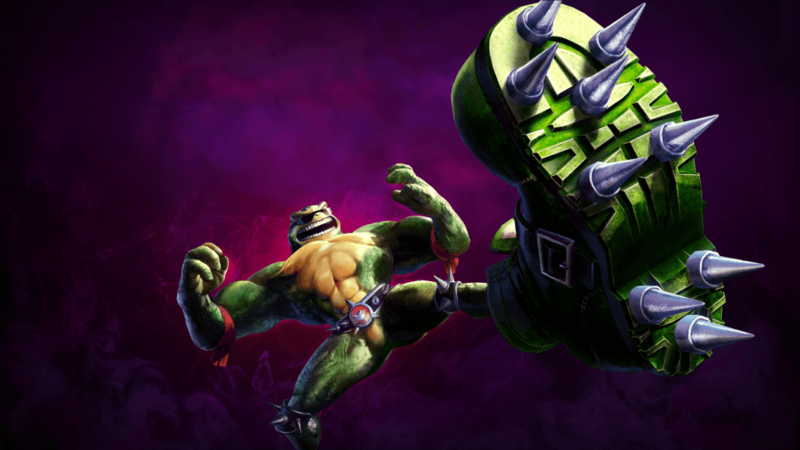 Yep, Rash is the #1 voted ‘most fun’ character. And it isn’t even close. The team has discussed this a lot, and we have our ideas why everyone loves him so much, but we’d love to hear from you in this thread. Why is Rash so fun? I don’t have another fancy graph for you…. Now I know you all are really interested in the other parts in the survey and I cover some of those in the questions below. For the rest of the stuff… well, I promise we’ll get to them in another Textual Stream. Thanks for being patient with us, and most of all thank you for your continued support and passion for Killer Instinct! Let the Textual Stream Questions begin! @TastyRC Is there a chance we could get new accessories for old characters? The team discusses this all the time, and my guess is that it will eventually happen. Our first priority was making sure the new ones got all the fixin’s. @laynewross I just wanna know if there will be a Season 4 so I can give you more money. You’re my kind of fan. @jmeek1812 after Shadow Lords what is the future of Killer Instinct? The future is what you make it! If I were to tell you there was a master plan, I would be lying. We’re in the business of making stuff people play. If you play, then it’s more likely for us to keep making it. It really is that simple. @rcont024 Will Shadow Jago get accessories? I hope so. @waffleyman When Killer Instinct is all said and done, would Iron Galaxy move onto another old school fighting game? @thekeits and I were talking like a month ago. He said (paraphrased) that he would be fine with working on Killer Instinct for life. Maybe I would be too. It’s been a great gig and really fun to be a part of this. @dooms_eye Can we expect any kind of announcement about Shadow Lords this month? Not my field, but probably! From @rukizzel Early access for Shadow Lords is coming, and we can’t wait to share more with you! As it stands you’ve more than likely noticed a few of the Iron Galaxy or Microsoft employees online protecting the earth from the threat of Gargos, earning Achievements along the way, and soon you will be able to join us. We’ve been lurking in the shadows (no pun intended, I swear) gathering names of those willing to participate, and will begin rollout to said folks in the coming weeks. The goal is to have a sizeable group of you playing later this month, but the exact date remains a little fuzzy. We’ll be sharing more details on this process and how you can be a part of Shadow Lords at a later time, but for now stay active in the forums, and keep your eyes on ultra-combo.com for the juicy details. MandrillManiac – Who was the magnificent guy/gal who created the character design for Gargos? It’s not any one person. It really is a collaboration between MS/IG. Design, concept, art, combat. The biggest sticking point on that character was how much his wings should be weathered. On one hand, he’s a badass, on the other, he’s a badass who’s been through a lot. Ultimately we went with weathered. xMasterStonex – Any news on Shadow Lords release? I would think so. It’s such a massive mode. We’re taking our time with it and getting it right. Remember how in Season 2, it was sad that the last character was a wrap? I love this because we’re saving our best for last. What a season. Yperdaimonious – Is it bad to ask for 3 more seasons? Not bad at all. I hope so too! Is there any bonus character? Season 3’s slate of characters is finished. Any early Shadow Lords release for common people like me? It’s entirely possible. oTigerSpirit – Aside from Shadow Lords and the new Multiplayer Mode, will there be additional content to the game? Shadow Lords and its multiplayer will conclude Season 3 – with a bang. AJmon- Are Holiday colors and accessory colors no longer a thing outside of the already existing Christmas set? What prompted the original incarnation and later dropping of the idea? Yeah, we would love to make a lot more of those. The original idea wasn’t very dramatic… I think we literally just finished KanRa and it came up in a production call. it was literally just a ‘hey we think Candy Canes would be great – who could wield those?” We almost made bunny ears for Easter too. Maybe some day. CriticalSix4677 – Since Eyedol was already being made during the Community Surveys, can we assume that the #2 ranked among the most wanted characters is now #1. Also can we expect to see the highest-voted characters sometime in KIs future? I think that’s a reasonable assumption to make. As an aside, Eyedol crushed everyone. You all love you some Eyedol! Bearcave05 – How many unlockables will Shadow Lords have. Rough number. I don’t really have a number, but if you count all of skins, dossiers, consumables, artifacts, and Guardians, it’s easily over a hundred. Lago407 – What survey results surprised you guys the most – Good question – everyone’s different I guess. I was genuinely amazed by how much everyone wanted Eyedol. We were also surprised that Rash was voted #1 most fun. Was there a general theme? A lot of you seem to really want more Ultimates. People wrote those in and check marked them in the survey. Truecarnage08 – How do you guys decide colors for characters? It’s really a collaboration between @theartbutton ‘s team and @djamesgoddard. James pours a ton of energy into those things and it shows..
Oppyz666 – Will some KI character appear in Divekick? Maybe one day! BrrDub – Regarding the Reimagined characters mentioned in the polls, will they be “evolutions” of existing characters? When we said ‘Reimagined’, it’s just as you suspected. It would be a twist on a current character that makes them feel new. We learned a lot about what everyone wants, and part of the way we learn is to throw ideas out there and see if something lights a spark. To some extent, we’re all along for the ride like you all are. C88Zeromancer – Is KI finished after Shadow Lords? Never. Keep playing. To the 28 of you that asked about a Community Fund – I hope so – we’ve been hearing you loud and clear. The previous one was very successful. Ping @rukizzel and let him know what you’re thinking. RyuHayabusaX – Does the Astral Plane have a Stage Ultra? No way, the Astral Plane is impervious to puny Earthly destruction! Do you plan on further unlockables for Shadow Lords? We’d love to do more. The great thing about the mode is that it is very expandable and we hope to keep adding more and more stuff to it. This is one of the core reasons why we thought it would be so much better to go this way than the usual story mode. Ironflame – If offered character suggestions, would you be willing to view suggestions? I really appreciate your passion for this game. Unfortunately, we can’t formerly accept or review submissions for a number of reasons. The best thing to do would be to post them in these forums and there’s a good chance we’ll read and see them, and potentially take inspiration from them, just like anyone else. Do you guys also think @thekeits current twitter profile pic looks like a miniature Terminator? Yep… which seems very fitting for him actually. Sightless Kombat – Is Shadow Lords the only way to unlock the Astral Plane and anything else to come out of that mode after you complete it? Yes, you have to beat Shadow Lords to unlock the Astral Plane for now. There may be other options in the future. I can’t speak to other stuff. But there are a lot of unlockables in the mode, including new skins! Also any chance of a new announcer? It’s something we’d like to do for sure. Player094872771 – I know that yall talk about or hinted at Shadow Orchid. Is yall still thinking about pursuing that vision – @ishmae1 is always a strong proponent of Shadow Orchid, so you never know! Gundrill – What is everyone’s thoughts on Loot Drops – Who isn’t in favor of loot drops?!?! I think Shadow Lords will be right up your alley…..
Supermariofan20 – Will the guest characters have any relevance to the story? I know that’s a weird question. We don’t think that’s weird at all – the guest characters are really that – ‘guests’, and as such are non-canon. They will be playable in Shadow Lords mode. I use Rash a lot in playthroughs, myself. BblackOrchidd – What exactly is the KI Gold for? I know a lot of you have KI Gold stored up over the year or so and you’ll be happy to know there will be plenty of other uses for it in the near-future, including SL mode. And now some Combat Words from Adam Heart (@thekeits) and the KI Combat Team! @EpicGameNights Where did the inspiration for Gargos portal punches come from? We knew that Gargos had to come through a portal to get to KI’s world, so from there we assumed that as the god of his realm, he could manipulate these portals to travel great distances. He also looks at his opponents as a pitiful joke, and seems to enjoy toying with them. From there it was pretty natural to have him punch you through a portal like a big jerk. @born4gaming1 which character out of s3 was the hardest to create? Gargos by far. Creating his minions in the KI system and getting them to work on their own, and then having Gargos grab and interact with them… it was very challenging. Gargos also is not like any other character we’ve ever played, so we couldn’t really take lessons from other games or previous characters when making him fun and trying to balance him for competition. @dayv0 Do you consider Gargos as a puppeteer? Not at all. Puppeteer characters have direct control over their puppets. Gargos minions kind of do what they want most of the time and will even mess up your combos. @vergovan Conceive a moveset for a giant chicken. Peck. Of the KI characters, Gargos. Of the original new KI characters, Aganos. @truecarnage08 How difficult was it designing gameplay for Arbiter and General RAAM since both characters came out in shooters and really don’t fight with their fists? Pretty easy, honestly. Both characters have rich backstories and cool technology or abilities to explore. Coming up with a fighting game moveset to highlight the characters wasn’t too hard at all. We hope we did a great job! Thanks for reading everyone, we’ll have one much sooner than it took for this one!